'Gardenside', the Frederick A. 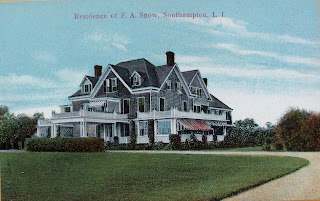 Snow residence built c. 1900 in Southampton with landscaping designed by Clarence Fowler. Click HERE for more on 'Gardenside' and HERE to see it on bing (it has been extensively remodeled). Mark Hampton's living room in the former 'Gardenside' outbuilding he renovated for himself. I understand the famous ‘Vogue’ photograph was taken in Mrs. Balsan’s drawing room at ‘Oceanside’ in Southampton but I cannot place that room in that house. • I’m looking at the original house & wonder: were the original ceilings as high as what is in the ‘Vogue’ photograph? • In the ‘Vogue’ photograph there is a fireplace at the left edge of the picture & looking at the fireplaces now I cannot place the ‘Vogue’ room in any of those locations. The windows in the ‘Vogue’ photograph have heavy cross beams high up, matching the room in the new extension right of the front door; but those windows don’t wrap around on the same wall as the fireplace & I doubt someone later bricked up those windows. I just want to throw my observation out there. I hope Otto is doing well. I sold my copy of 'Vogue's Book of Houses, Gardens and People' (there was a brief time that the book selling for $1200.00 a copy--I found it hard to resist), and I cannot find the Vogue article online, so I cannot find the exact wording, but I remember that the room was an addition that Mme. Balsan made to the house, using 18th c. boiserie. The article describes the awkwardness of the house, and her improvement by bringing in the 18th century boiserie and creating this room. 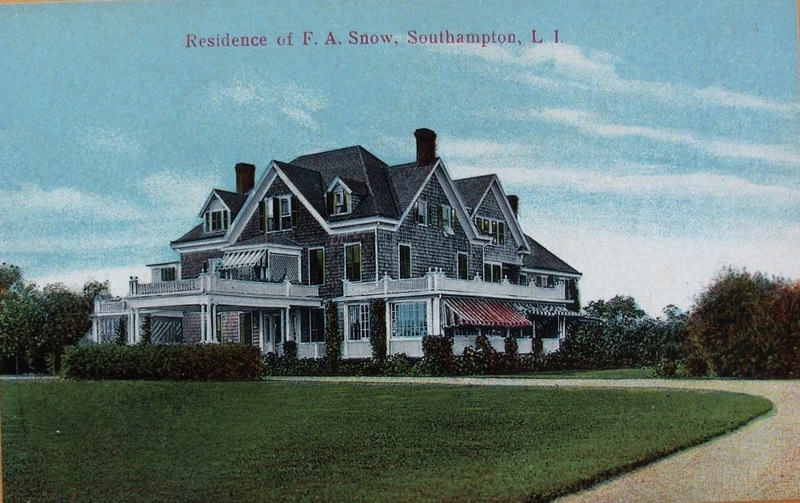 It is not beyond the realm of reason, especially in the ever-renovating Hamptons that the next owner removed the room----remember that the sixties were the nadir for grand houses and rooms, and that downsizing was common, unlike now. Just speculation, but I do assure you that the room was in the house when Mme. Balsan was photographed in it. The Vogue article's wording went as follows: "at eighty she bought her house at Southampton . . . Garden Side, as it was called, stood in several acres of land, but it had then no garden to speak of ~ though it was true that from whichever direction you approached it, it was as though you approached it from the side. Around the lawns, thick-growing pink begonias weave an immense arabesque. Roses grew to the size of dahlias, and dahlias to the size of cabbages. A long drawing room, recently added to the house, provides it at last with a recognizable facade, and is moreover in itself the perfect product and epitome of one who regards old age not as a penance but as a privilege. It is a sort of pavillion, lined with boiseries from a French chateau, and hung with yellow silk curtains, where she can sit in all weathers almost as though she were in a sunlit garden. Meagre windows in the alcoves, at either end of the dining room have been unrecognizably enlarged so that she can lunch similarly, almost al fresco. In short she has produced not only a surpassingly beautiful garden and interior, but a comfortable and well-appointed house; too ~ and how indicative of its true atmosphere ~ that of all the houses she has owned in America is the one her domestic staff like best. (Since for the last twenty years they have ~ happily for everyone ~ been virtually the same staff, they know their subject.)" Though I don't have the book, I xeroxed the text from a copy borrowed on 'Inter-Library Loan' The article was titled, "Madame Jacques Balsan: Portrait of a Unique American"
I will hazard a guess that the room might be the wing that is to the right of the front door. It replaces what was a porch in the original picture. There is a fireplace at the end and there might be some height to that room as it would probably involve a step down from the original house and its roof is higher than the porch room height. Mme Balsan certainly proved herself, through the years, to be her mother Alva's daughter when it came to houses. I appreciate everyone’s comments & reading Zach’s May 18, 2012, post for ‘Gardenside’ see that Magnus visited this house while Mrs. Balsan lived there. Magnus, is the drawing room in the 'Vogue' photo part of the house that is extant or was it added by Mrs. Balsan & has since been removed? Thanks in advance for your input. Doug: I was so young when I was there that I can't remember those details. I wish I could help. I do remember reading somewhere that when Mme. Balsan left in the fall, the best of the French furniture was crated up and sent down to her house in Palm Beach for the winter. On a different, but slightly related topic, I highly recommend the recently published "Living Artfully: At Home With Marjorie Merriweather Post"- a wonderful meringue of photographs and reminices of and about a woman who was really rich when people simply weren't rich. This post on Mme. Balsan reminds me of a story I read once: the highly refined Mme. Balsan was taken to Hillwood,to take a gander at the stupendous collection of French furniture and French and Russian objects collected there by Mrs. Post. Quite unlike the understated and highly refined backgrounds created by Mme. Balsan, the redoubtable Mrs. Post had used enough gilt to exhaust a gold mine. Mme. Balsan apparently suggested that perhaps Mrs. Post might consider banishing what she considered the Drawing Room's most egregious item- a Steinway piano that Mrs. Post had gotten up all in cream and gilt faux Louis XV style. The piano apparently stayed. Sorry to veer so far off topic. But get the book. It's a hoot. Thank you all for sharing your memories and finds! These details are tremendous!